I made butter this week. Yes, yellow, creamy butter. I had been wanting to make butter since my youngest came home from school and told how they made butter by shaking little jars for “about a million hours.” He said they had crackers and they tasted it right after making it. About a week or so after the school butter-making event, my newest spring magazine featured a story on making your own butter and adding all kinds of spices and flavorings. I did not especially want fig/pear butter or hot chili/sweet chili butter. I simply wanted to learn how to make my own butter from scratch. 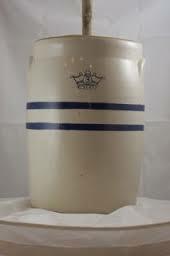 Some of my earliest memories are of sitting at my grandmother’s old crockery churn and pulling the paddle up and down, up and down, up and down. When we weren’t pretending to churn butter we were running the treadle on the old sewing machine as fast as we could because it sat right next to the butter churn. I am sure we drove her to distraction because there were eight little girl cousins all around the same age. If one wanted to churn you can bet the others did as well. As I grew, I learned very quickly how to sew and make my own clothes, but I had never made butter. I suppose that when folks moved off of the farms and into towns there was not an easy supply of cream from which to make butter. Add in the ease in which o ne could pick up four sticks of butter each and every time they made purchases at the grocery and butter making was not as important as it once had been. Then along came Parkay which whispered about NOT being butter and millions were hooked. Most of America moved from rich butter to plastic spreads. I remember that our family ate plastic spreads for about five years and then my mother declared it unhealthy and we went back to purchasing real butter. I bake with butter because I grew up baking with butter. I keep soft butter out on a saucer because it is easier to spread on hot bread straight from the oven. If you go to my sister’s house, you will find soft butter in a small tin bowl with a plastic lid. Butter. Not plastic spread. There have been times when butter was way more expensive than plastic spread, but I stuck with it and saved elsewhere. And just like many other natural things, I find that butter is making a comeback. This time I plan to make my own. Because of the snow, I had to wait to get my butter supplies. All I needed was some heavy cream and we were in business. The day finally arrived. I hurried through Walmart getting the other groceries and placed the carton of cream in the basket right beside my purse. I would make it sometime during the week. The next morning I heard hubby rummaging around in the fridge and the freezer. “What are you looking for?” I hollered at him. “We should have some extra boxes in the freezer.” I got up to look. No butter in the house. A light bulb went off and I announced, “I am going to make butter from scratch this morning.” By now there was an audience and they moaned. I held up my hand. “It says that it will take less than fifteen minutes.” They rolled their eyes and ambled into the TV room. I clapped my hands in anticipation and ran to get the magazine. Now was my chance! I had to make my own or do without! Just like grandmother! I plugged up my nifty, apple-green mixer, poured in the cream, cranked that baby all the way to “high” and let it whir – for about five seconds and then I turned it off. Heavy Cream was everywhere. I smiled lightly to my husband and placed the clear plastic screen on the mixer and cranked it again. I watched it go from white liquid, to white chunky liquid, to a whitish cream, to light yellow chunky, to yellow smooth sitting in a pool of white liquid. Eureka! We had butter. I had to knead it, dry it, wash it, dry it, roll it into a ball but we had real butter! In less than fifteen minutes! It was not churned by hand and it was not from my own cow and it lost some of the rich taste because of pasteurization, but I think my grandmother would be impressed that I even tried it. Of course, she might be more impressed with my apple-green mixer that whirrrrs at unbelievable speeds. This entry was posted in Posts, Stories / Articles and tagged Christian, Family, making butter, Mother, parents, work. Bookmark the permalink.